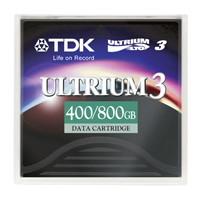 TDK Life on Record LTO Ultrium 3 Data Cartridges combine the latest technological advancements with proven reliability to deliver the kind of data backup performance that makes your business run seamlessly. With 400 GB native (800GB compressed) storage capacity and a blazing 40 MB per second native (80MB/s compressed) transfer rate, TDK LTO-3 Ultrium-3 cartridges are the ideal media solution for your Ultrium 3 drive. LTO3 Ultrium3 cartridges are available in rewritable and write-once/read many (WORM) formats.